You can now book a cheap flights to Budapest from $671 thanks to our deal hunting editors who brought you this Aeroflot airfare deal. Get the flight now and save over $150 compared to any other airline flying on this route on the same dates! 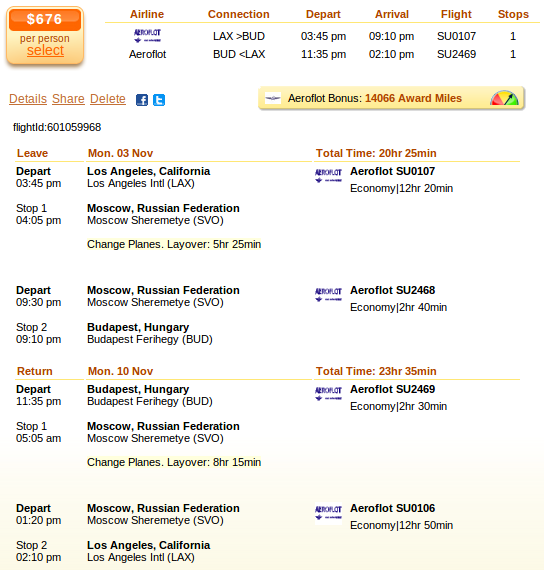 Check out the screenshot below and you can see that your flight starts from Los Angeles International Airport (LAX) and arrives to Ferenc Liszt International Airport (BUD) on November 3 and returns from Budapest on November 10 2014. The flight has one stop in Moscow both ways, first for 5 hours 25 minutes, then for 8 hours 15 minutes. Aeroflot Bonus, the airline’s frequent flyer program will also provide you with 14,066 award miles for this airfare which is a great start for collecting for a free flight. Book this Aeroflot flight to Budapest and save over $130 on your flight. While the cheapest flight costs $676 r/t, the next best one, operated jointly by United Airlines and Lufthansa, costs $810 r/t. This means you save a lot of money if you choose to fly with the Russian flag carrier and book the airfare right now, before the price goes up. This entry was posted on Wednesday, May 14th, 2014 at 12:29 pm and is filed under Airfare Deals. You can follow any responses to this entry through the RSS 2.0 feed. You can leave a response, or trackback from your own site.